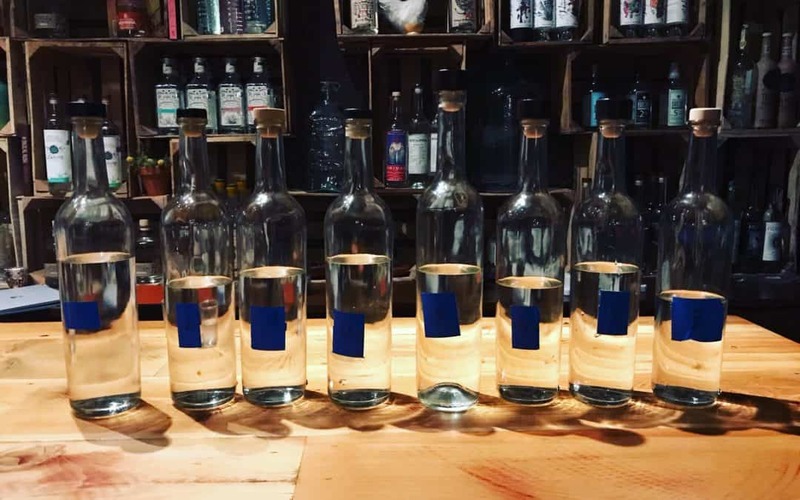 Taking advantage of being in the backyard of Khrys Maxwell we developed some programming around Mexico in a Bottle San Diego by co-hosting a blind tasting of agave distillates at Tahona Bar in Old Town San Diego last Monday. It was a rainy night, so sipping through eight different agave distillates was definitely called for. Khrys put together the list and much like the last one we hosted, it was hard. The crowd of 20 was a mix of novice and professional which made for a great combination. The idea of these tastings is to get people to dive deep into what creates flavor and differentiation. There were four categories you had to identify – agave, region, brand, and cooking method (for the agave, not distillation). I think for future tastings we are going to add a space to keep track of flavor notes, The format was four rounds of two distillates, ten minutes for each round, and then the opportunity to go back and taste once we completed the rounds. As the keeper of the time, and of course as the other person who knew what we were drinking, I abstained – it had nothing to do with feeling completely intimidated. A total of 32 points could be earned – the winner got 13 and took home a very special blend that we can’t wait to hear about. We can’t wait to do more of these because they are such a great way to dive into the complexity and range of agave distillates. Conversation definitely opens up after the first round and gets boisterous by the end. It was interesting which ones threw everyone for a loop. The Vago and the Derrumbes definitely stumped most people, perhaps because they were thinking we wouldn’t have included such accessible ones. The Bañuelos was something no one would have gotten unless they have spent time in Mexico and the Caballito Cerrero hasn’t been in the market long enough for most people to have tried. We did a Facebook live post so you can see it all here. We’ll also be sure to do that for the next one and will try to make it more visually interesting as well.